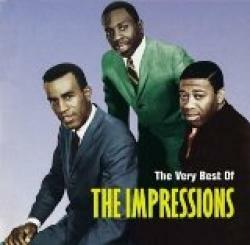 The Impressions are an American music group from Chicago, originally formed in 1958. Their repertoire includes doo-wop, gospel, soul, and R&B. The group was founded as The Roosters by Chattanooga, Tennessee natives Sam Gooden, Richard Brooks and Arthur Brooks, who moved to Chicago and added Jerry Butler and Curtis Mayfield to their line-up to become Jerry Butler & the Impressions. By 1962, Butler and the Brookses had departed, and after switching to ABC-Paramount Records, Mayfield, Gooden, and new Impression Fred Cash collectively became a top-selling soul act. Mayfield left the group for a solo career in 1970; Leroy Hutson, Ralph Johnson, Reggie Torian, Sammy Fender and Nate Evans were among the replacements who joined Gooden and Cash. Inductees into both the Rock and Roll Hall of Fame and the Vocal Group Hall of Fame, The Impressions are best known for their 1960s string of hits, many of which were heavily influenced by gospel music and served as inspirational anthems for the Civil Rights Movement. They are also 1998 Grammy Hall of Fame inductees for their hit "People Get Ready", and are winners of the Rhythm and Blues Foundation's Pioneer Award (in 2000) .